Indiana Academy is located in rural Cicero, a small town 30 miles north of Indianapolis. Cicero has all the advantages of a small hometown; a peaceful setting, safety, and friendly residents. Being within driving distance to Indianapolis provides access to great shopping, restaurants, cultural events, the zoo and sporting events. 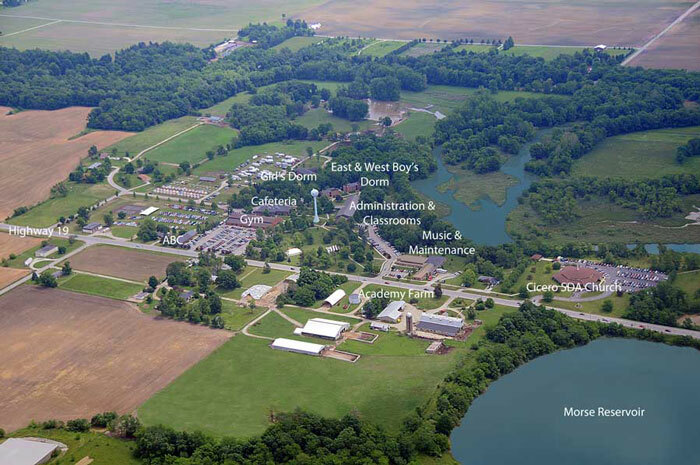 The 500 acre campus is modeled after a small college setting with an expansive treed landscape with detached buildings. There are three dormitories, one for the women and two smaller dorms for the men. Dining services are provided in the cafeteria and meals are served buffet style with the opportunity of seconds or thirds! The large gymnasium and ball field is used for physical education classes, intramural sports, and recreation. Most classes meet in the administration building, while music classes and daily chapel meet in the music building. How is IA different from public school? The teachers at Indiana Academy are much more engaged with the students than in a typical public school. Not only are the teachers here to teach, but they also mentor the students. Each teacher and staff has a group of students they are responsible for call their Faculty Family. This includes inviting the students to their homes for Friday evening worships and social events from time to time and checking in with them throughout the year to make sure they are doing well in their classes. Teachers and staff encourage students to talk to them about any issues and questions they might have. Teachers are available to help students after class, and students can email or call the teacher after hours for special assistance. The teachers and staff are dedicated to the character and spiritual development of each student. Teachers and staff interact with students on the weekends and are involved in weekend supervision. Dorm students also have two deans who are responsible for them in the dormitories that act as their mentors away from home. In addition to our outstanding faculty and staff and high academic standards, at IA we believe in educating the whole person: mind, body, and spirit. This means education at IA goes beyond the classroom through religious programming, intramural sports, social and recreational activities, music tours, mission trips, monthly service projects, and more. Breakfast is at 6:30a on weekdays, and class or work starts at 7:30a. Typically, Juniors and Seniors go to class in the morning and Freshmen and Sophomores go to class in the afternoon. Classes at IA are on a split schedule, which means each class meets every other day for 80 minutes. There is a short Chapel period every day just before lunch. After lunch, we offer music, gymnastics, or photography for those who wish to register for electives. Then Juniors and Seniors go to class and Freshmen and Sophomores go to work for the remainder of the afternoon. Most students work on campus 2-3 hours per day and the money they earn goes towards their school bill. Supper is at 5:30p. After supper, students have the opportunity to participate in intramural sports during Recreation. Depending on the season, there is soccer, flag football, volleyball, basketball, and more. Students can also use Recreation time, or "Rec" as we call it, for personal exercise by running around the track outside or working out in the fitness center in the gym. Students also have the option of staying in the dorms during this time. There is worship in each dorm following Rec every night, followed by study hall. Lights out in the dorms is at 10p or 10:30p, depending on grade level. What is a typical weekend like? Students are free to go home on the weekends, but if they decide to stay on campus there are a variety of activities and programs for them to participate in. Non-dorm students, or "Village students" as we like to call them, are always welcomed to participate in weekend activities. Vespers, our Friday evening worship service, takes place every Friday evening in the chapel. There is often Afterglow, a time spent in more intimate praise and worship, following the program for those who choose to participate, as well as time to socialize in the dorms. Residents eat Sabbath breakfast in the dorms. Sabbath School starts at 9:15a at the Cicero Seventhy-day Adventist church, followed by the 10:50a church service. Lunch is served in the cafeteria after church. Sabbath afternoon activities are optional and include nature walks, canoeing, and park trips when the weather permits, and games or religious movies during inclement weather. At sunset, Hallowed Moments worship service closes every Sabbath. Saturday night activities are planned every weekend and can be anything from outdoor movies and bonfires, to miniature golf outings, or games in the gym. Sunday is a free day and is usually unscheduled. Sunday brunch is served in the cafeteria at 10a and supper is at 4p. There are often town trips for shopping or activities sponsored by the Girls Club and Guys Club in the dorms. Sunday nights include recreation in the gym or on the ball field, dorm worship, and study hall. Does everyone live on campus? Not at all. While the majority of our students are residents in the dorms, many of our students live off campus at home with their parents or guardians. However, these "village" students are welcomed and encouraged to participate in all the activities we offer to our residents. Do dorm students get to go home? Of course! Students are free to go home or to a friend's house on the weekends if they so choose, just as long as they follow the proper "check out" procedures through the dorm. Additionally, there are extra-long weekends every 4 1/2 weeks called home leaves where campus closes from Wednesday at noon until Sunday at 4p, which gives dorm students the opportunity to go home and spend time with their families. How often are home leaves? In addition to the regular holidays such as Thanksgiving, Christmas, and Spring Break, there are also regular home leaves every 4 1/2 weeks. Just before a home leave there is an abbreviated school schedule on Sunday. On home leave days, school gets out on Wednesday at noon and students return Sunday between 4-10p. Students are required to leave campus during all breaks and home leaves. What is the food like at IA? Indiana Academy serves typical American food with an assortment of international dishes. Food is served buffet style and you can return for seconds as desired. Menu selections are carefully planned and are designed to provide a healthy balance of nutrition. At lunch there is a large salad bar in addition to the entree line. Fresh fruit, toast, and cereal is always available. All meals are vegetarian and there are also vegan and gluten-free options for students with dietary restrictions. Food costs are included in dorm students' tuition while meal tickets are available to purchase for non-dorm students that don't bring their own food from home. What is the social life like at IA? One of the success factors of life is choosing good friends with common interests and shared values. Besides the academic and spiritual aspects of life at IA, this is the secondary reason why IA exists. Peer pressure and media influences can be a major negative factor in a teen's life. While not a perfect environment, IA strives to teach Christian principles in all that it does. Students get to interact with other like-minded students in a drug-free, safe campus with social activities that uplift Christian values. There is a social activity every Saturday night and optional intramural sports during the weekdays. Students participate in Student Association events such as formal banquets, Christmas parties, and other activities that help build school spirit and camaraderie. Students can also join the Girls' and Guy's Clubs that have events on and off campus throughout the school year, including campus games, ice skating, bowling, laser tag, etc. Are there a lot of rules at IA? Just like at home, there are rules at IA that help many different personalities coexist peacefully. Look through our Sourcebook for a complete set of policies. Does IA have a uniform? Indiana Academy implemented a structured dress code to teach students the concept of appropriate dress for appropriate occasions. During class, students are required to wear approved pants and polo shirts with the school logo. These can be purchased through Land's End. Outside of class, other dress code guidelines apply. Please review our Sourcebook for our full dress code policy.